Real-time technology is one of those things we take for granted sometimes. It’s a convenience for most consumers. Turn-by-turn navigation, ordering rideshare service, and even watching the status of your pizza. Real-time technology has revolutionized personal convenience, but are you harnessing real-time technology in your supply chain? RFID asset tracking and RTLS (real-time location systems) go beyond personal convenience into intelligent solutions that can significantly increase asset visibility both inside and outside the four walls. Once installed, RFID asset tracking and RTLS operate with little to no human intervention. RTLS, as the name implies, is technology that promotes real-time visibility. When combined with RFID tags and cloud-based software, RTLS gives you the opportunity to monitor your inventory, assets, and equipment at all times. One key feature of RTLS is that it goes beyond just real-time tracking in that it can pinpoint the exact location of your assets from a few meters to within a few feet. This is extremely beneficial in cases where you have a large warehouse requiring multiple items that need to be tracked within the same general area. RTLS is made possible through wireless solutions, including RFID, Wi-Fi and Bluetooth, GPS, and beacons. 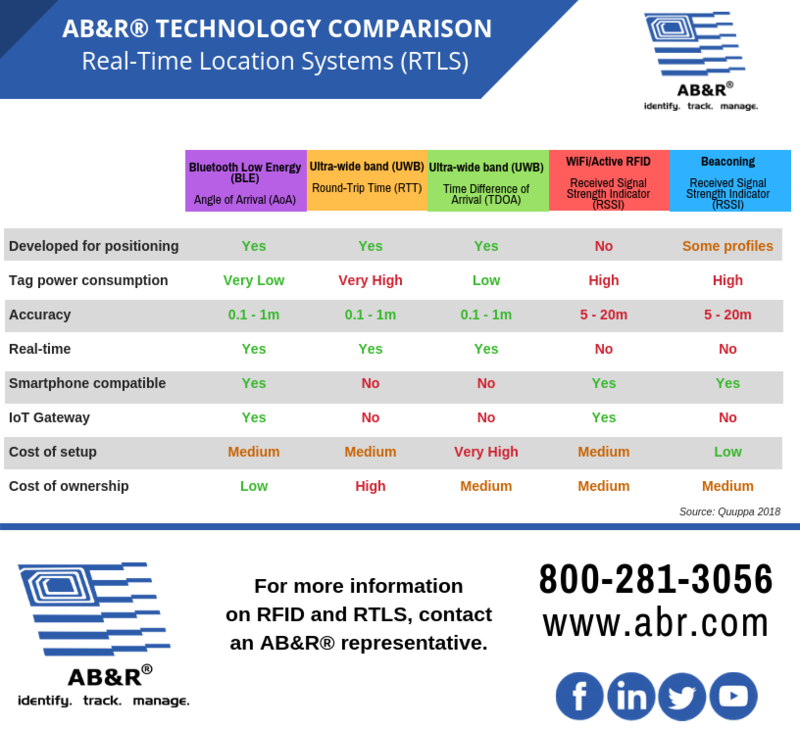 To learn more about the different RTLS technology available and the features of each, see the graphic below. A real-time location system must be installed correctly to ensure the right sensors, RFID tags, and software are selected. Failure to do so can result in a system that can’t properly monitor all aspects of your property. That’s why AB&R® recommends our Solution Process, which is a consultative approach to installing an RFID asset tracking and RTLS system. Our site survey gives our engineers the opportunity to learn more about your facility and identify critical locations for RFID readers. Pilot programs are designed to implement a solution on a small scale to gather more data. Finally, the implementation phase of our Solution Process includes a well-engineered solution to set you up for success. To get started to an RFID asset tracking and RTLS, we recommend scheduling a 30-minute phone call with us so we can discuss all your needs and wants. To do so, click below to schedule a time that’s most convenient for you.